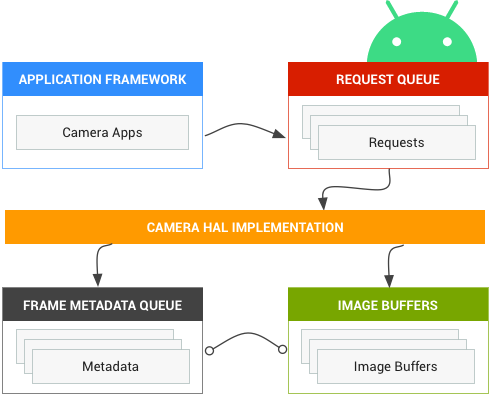 Android's camera Hardware Abstraction Layer (HAL) connects the higher level camera framework APIs in android.hardware.camera2 to your underlying camera driver and hardware. Android 8.0 introduced Treble, switching the CameraHal API to a stable interface defined by the HAL Interface Description Language (HIDL). If you have previously developed a camera HAL module and driver for Android 7.0 and lower, be aware of significant changes in the camera pipeline. 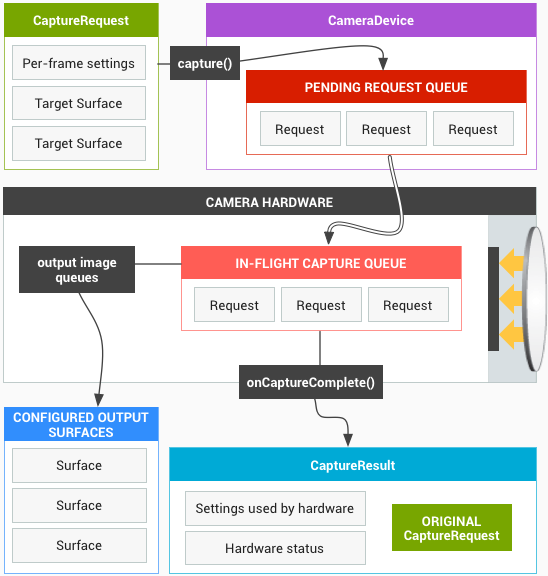 The aim of the Android Camera API redesign is to substantially increase the ability of applications to control the camera subsystem on Android devices while reorganizing the API to make it more efficient and maintainable. The additional control makes it easier to build high-quality camera applications on Android devices that can operate reliably across multiple products while still using device-specific algorithms whenever possible to maximize quality and performance. Version 3 of the camera subsystem structures the operation modes into a single unified view, which can be used to implement any of the previous modes and several others, such as burst mode. This results in better user control for focus and exposure and more post-processing, such as noise reduction, contrast and sharpening. Further, this simplified view makes it easier for application developers to use the camera's various functions. The API models the camera subsystem as a pipeline that converts incoming requests for frame captures into frames, on a 1:1 basis. The requests encapsulate all configuration information about the capture and processing of a frame. This includes resolution and pixel format; manual sensor, lens and flash control; 3A operating modes; RAW->YUV processing control; statistics generation; and so on. A Result object with metadata about the capture. One to N buffers of image data, each into its own destination Surface. Each Surface is a destination for a stream of image buffers of a fixed resolution. Only a small number of Surfaces can be configured as outputs at once (~3). A request contains all desired capture settings and the list of output Surfaces to push image buffers into for this request (out of the total configured set). A request can be one-shot (with capture()), or it may be repeated indefinitely (with setRepeatingRequest()). Captures have priority over repeating requests. Note: As Camera HAL1 has been deprecated, Camera HAL3 is recommended for devices launching on Android 9 or higher. Each mode has slightly different and overlapping capabilities. This made it hard to implement new features such as burst mode, which falls between two of the operating modes. Android 7.0 continues to support camera HAL1 as many devices still rely on it. In addition, the Android camera service supports implementing both HALs (1 and 3), which is useful when you want to support a less-capable front-facing camera with camera HAL1 and a more advanced back-facing camera with camera HAL3. There is a single camera HAL module (with its own version number), which lists multiple independent camera devices that each have their own version number. Camera module 2 or newer is required to support devices 2 or newer, and such camera modules can have a mix of camera device versions (this is what we mean when we say Android supports implementing both HALs).